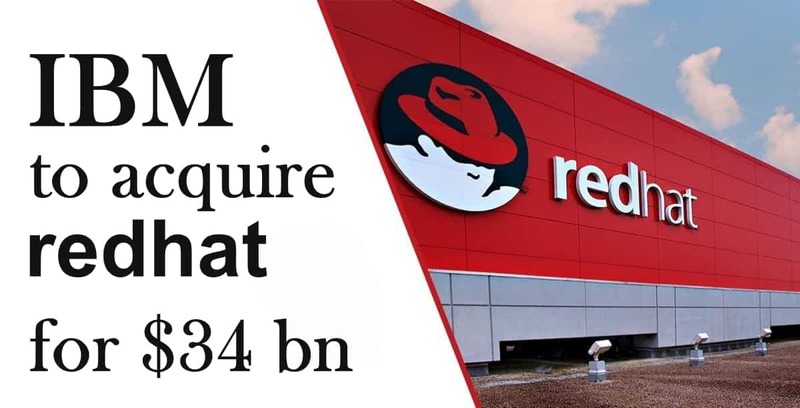 IBM has agreed to purchase U.S. open-source software company, Red Hat in a blockbuster deal of $33.4 billion in its largest deal ever, and the third-biggest in the history of U.S. tech. This deal is aimed to expand the company’s subscription-based software offerings in the fast-growing and profitable cloud market. In an agreement expected to be finalized in the second half of 2019, IBM will purchase all of the issued and outstanding common shares of Red Hat for $190 per share in cash, which is a 63% premium over the company’s Friday’s closing share price. “The acquisition of Red Hat is a game-changer. It changes everything about the cloud market,” said Ginni Rometty, Chairman and Chief Executive Officer of IBM, said in a press release announcing the deal. “IBM will become the world’s number one hybrid cloud provider, offering companies the only open cloud solution that will unlock the full value of the cloud for their businesses. IBM said Red Hat will continue to build and improve Red Hat’s current partnerships, including those with major cloud providers, such as Amazon Web Services (AWS), Microsoft Azure, Google Cloud, Alibaba and more, in addition to the IBM Cloud. Simultaneously, Red Hat will benefit from IBM’s hybrid cloud and enterprise IT scale in helping expand their open-source technology portfolio to businesses globally. The combination of IBM and Red Hat should quicken cloud adoption by large customers who still must connect old technology with new, added Arvind. Once the acquisition deal is closed, Red Hat will become a unit of IBM’s Hybrid Cloud division, with the goal of maintaining the “independence and neutrality” of Red Hat’s open-source development heritage. Jim Whitehurst, President and CEO of Red Hat along with its current management team will continue to lead the company. Whitehurst also will join IBM’s senior management team and report to Rometty. IBM has plans to maintain Red Hat’s headquarters, facilities, brands, and practices. “IBM’s commitment to keeping the things that have made Red Hat successful – always thinking about the customer and the open source community first – make this a tremendous opportunity for not only Red Hat but also open source more broadly,” said Cormier.